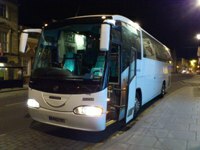 North Somerset Coaches has acquired a Scania Irizar coach from Princess Coaches in Southampton, with another to arrive imminently. The 53-seat vehicle is LEZ Euro 4 compliant and has replaced a Plaxton Paramount. David Fricker, managing director of the Nailsea-based operator, said: “It will be used for everything including school trips and excursions. It’s a good upgrade to the fleet. We’re moving away from Volvos; we’ve found the Scanias have passenger appeal. “As it’s LEZ it means we can take it to London – we don’t do it often but it’s always useful to have. The vehicle was greeted with praise after it was revealed on the company’s Facebook page on March 16. The major rebranding for Lucketts allows retention of individual company identities Lucketts Travel has announced a £2m investment in new vehicles and has unveiled a new look for its fleet.